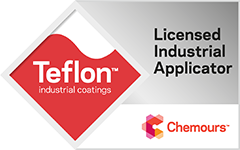 Teflon® and other fluoroplastic coatings have been used successfully in applications in the pulp and paper industry for long. Our wide range of coatings offers solutions for various different applications for the industry. Alu-Releco offers various coating solutions for chemical industry for applications for example in mining, fertilizer, medical and steel manufacturing industries. The coatings enable the use of less expensive materials and materials which are easier to machine. There is a wide range of coating solutions for metal and engineering industry for applications where low friction, non-stick properties, chemical resistance, corrosion resistance and/or wear resistance is required. The variety of applications is almost unlimited and new innovations are developed continuously. Teflon® and other fluoroplastic coatings have been used successfully in applications within the food industry for long. The coatings ensure easy cleaning of the parts and prevent the product from sticking to the surface. From the wide range of Alu-Releco’s coatings there are various solutions for applications for example in bakeries, dairies, meat processing plants, candy factories, professional kitchens etc. Alu-Releco Oy offers wide range of coatings for various different industries as the coatings in question have almost unlimited number of application alternatives.